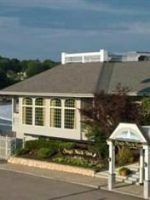 In York, Maine, you’ll find mostly motels, inns and vacation home rentals- with the exception of The Anchorage Inn. Just steps from Long Sands Beach, The Anchorage Inn is a true beach resort (with a bit of a motel feel) that features several pools, onsite dining, and multiple room variations — including units with full kitchens. The Main Building encompasses three floors, with rooms equipped with one queen or two double beds for families of four. Rooms are 240 square feet in size, and while you can order a rollaway bed or crib, it will be a tight squeeze. This building has shared balconies and patios. Book a room on the north or south end of the building for unobstructed ocean views. The Main Building also has an elevator. The Atrium Building is a fantastic choice for the family on a budget. And, rooms are slightly bigger than those in the main building, at 250 square feet. The only true difference in this building is the views -- either limited ocean vistas or views of the "gardens" (parking lot). Another advantage of staying in the Atrium Buiding is easy access to the lap pool. This building has an elevator. The Owner's Suite is more or less a house, with two bedrooms (each with a king-size bed), a living room, fully equipped kitchen, dining area and Jacuzzi tub. It also has a balcony that affords views of Long Sands Beach. This room can sleep four or five guests comfortably. Similar to the Owner's Suite, the hotel's Lofts feature two bedrooms (one on each floor) and a pull-out sofa (lower level), sleeping four or five guests. The loft has a half-wall, so it's almost completely private. There are three Lofts available. The Ocean Suites are the most luxurious option at The Anchorage Inn, and when we say luxurious -- we mean it. They feel like they were pulled from a luxury city hotel! Guests of the Ocean Suites enjoy a private outdoor pool of their own, complete with a waterfall feature. We’ve visited for 16 summers now. Always a joy to come back and relax in York Beach. The Anchorage offers multiple pools, indoor and outdoor, as well as easy access to the beach. A five minute drive to town shopping, eating and the arcade makes for a perfect getaway for families or couples. Who goes to the beach in January??? WE DO! 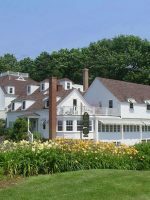 If you are looking for a very restful, low key get away weekend with no big crowds, give the Anchorage Inn at York Beach Maine a try. They a have a great 2 day deal which includes a $50 meal coupon at the restaurant just down the street. 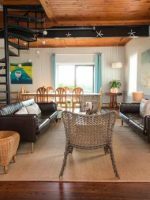 Free coffee in the morning, free parking and 2, yes two indoor swimming pools, this is a great location to get away from it all. Nothing going on except relaxing and watching the ocean and the day go by. No crowds.. No hassles... Give them a try. You will not be disappointed. The hotel has four pools for use by all guests: two inside and two outside. The indoor pools are located in the Main Building and Atrium Building; the indoor pool in the Atrium is a long lap pool (it runs the length of the building!) that's perfect for a workout or swim races. 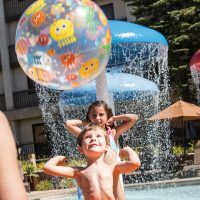 The outdoor facilities include a large activity pool with a waterslide, along with a small wading pool for little ones. The hotel is directly across the street from Long Sands Beach, where public restrooms are available. The beach is especially popular for boogie boarding and kite flying. The hotel's onsite restaurant, Sun & Surf, is located directly across the street from the hotel, right on Long Sands Beach. Enjoy your family meal with a view, inside or out. Sun & Surf offers traditional favorites, from burgers to salads, plus a wide assortment of seafood entrees -- clam chowder, broiled scallops, mussels, salmon and of course, lobster. And not just lobster, but lobster several ways -- boiled, stuffed, stewed, you name it! Sun and Surf, which has other locations in Maine and New Hampshire, also offers a kids' menu. It's open 7:30 a.m. to 9 p.m. daily. Order sandwiches, salads and other light bites from the Poolside CafÃ©, serviced by Sun & Surf Restaurant. The hotel provides free Wi-Fi. The hotel has a small fitness room with a decent array of cardio and strength training equipment. It's open 24 hours. 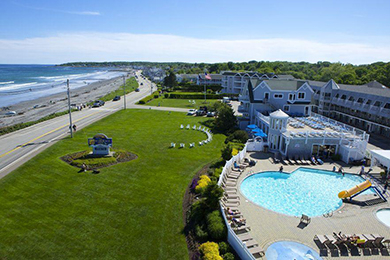 York, Maine and the Anchorage Inn are most popular in the summertime, of course, when people descend upon the area to enjoy its beaches: Long Sands (steps from the hotel) and Short Sands. Rates are just slightly cheaper in the fall, when York hosts HarvestFest. Your best options for flying to York, Maine are Boston Logan International Airport, about 1.5 hours away, or Portland International Jetport, about one hour away. When driving, you can expect a few small tolls. You'll want a car to get around York, Maine. While the town is very walkable, The Anchorage Inn is located further out from many attractions than other area hotels. It's within walking distance (as in, a few steps) to Long Sands Beach, however, as well as a few nearby snack stands and general stores. While grandma and grandpa watch the kids, go across the street for a cocktail at Sun and Surf, followed by a stroll on the beach. You could also stroll to one of the nearby stores for ice cream (just don't tell the kids).